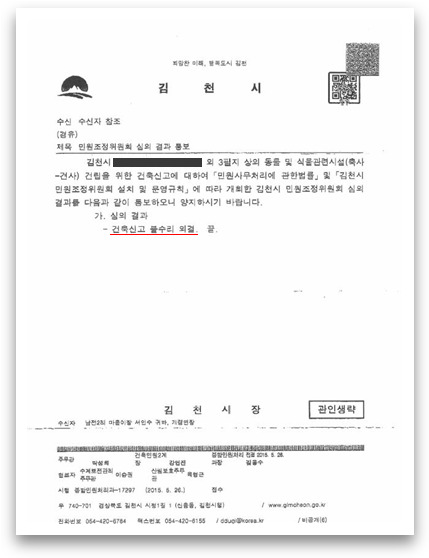 This is a translation of the June 23, 2015 posting on Korea Animal Rights Advocates‘s Website: 김천개농장주 허가 불허에 행정심판구하고 지역 국회의원은 육견협회 창립식 축사. In Gimcheon, a dog farmer seeks an administrative appeal to overturn a declined permit to operate, while at the same time a local member of the National Assembly delivers a congratulatory address at the inaugural ceremony of a local Dog Farmers Trade Association. Do you remember a dog farm in Gimcheon, Gyeongsangbuk-do province that was trying to expand their current operation by purchasing a new site to build a massive scale dog farm? Korea Animals Rights Advocates (KARA) and Busan Korea Alliance for the Prevention of Cruelty to Animals (Busan KAPCA) visited this dog farm’s planned expansion site back in April, and desperately asked for your help. → Click to read [Urgent] Please help stop the meat dog farmer who is threatening to breed 1,000 dogs by performing vocal cord removal surgery on them!!! And you did help! Many of you, including the local residents of Gimcheon, actively expressed opposition by filing civil complaints with the Civil Affairs Mediation Committee against the construction of this dog farm and, as a result, the new dog farm’s permit was declined. We have, however, received urgent notification that this dog farmer hasn’t given up despite the opposition of local residents and the decision of the City of Gimcheon. He is in the process of seeking an administrative appeal claiming that the City of Gimcheon declined his permit despite the fact that his facility is within the law in Gyeongsangbuk-do Province. Meanwhile, the National Dog Farmers Trade Association, created by the dog farmers to protect their interests, actively supported the Gimcheon dog farm as an exemplary dog farm and 100% lawful, and submitted a petition to the City of Gimcheon defending it. But they didn’t stop there. They filed two civil complaints with the Ministry of Agriculture, Food and Rural Affairs accusing KARA and Busan KAPCA of engaging in activity outside of what is “permitted for a Non-Governmental Organization” for helping the local residents who opposed the new dog farm construction to file their complaints. As a result, we had to spend valuable time and effort preparing and submitting a detailed response to those civil complaints. That, however, is not an issue for us, as our activity as an animal protection organization was clearly lawful and is specified in our articles of association. It is the reality of the miserable lives of these animals that breaks our hearts. Once again, KARA and Busan KAPCA have confirmed the horror of the dog meat trade through the Gimcheon dog farm that has been venerated by the National Dog Farmers Trade Association as being an exemplary dog farm. It is clear there will never be progress for our nation’s companion animal culture without first resolving the dog meat consumption issue. There is more that adds to our frustration. On April 19, dog farmers founded the Gimcheon Dog Farmers Trade Association. Present at the inauguration ceremony to congratulate the dog farmers were Cheol-Woo Lee, a current National Assemblyman (Saenuri Party); Myung-Ki Lee, a Gimcheon City Council member; and Young-Shik Im, Gimcheon Livestock Association President. → Click to see the article on Gimcheon Dog Farmers Trade Association’s Hanmaeum (One Mind) Festival. 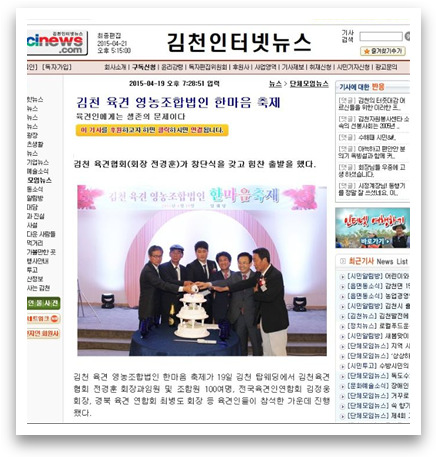 According to the article, National Assemblyman Cheol-Woo Lee (Saenuri Party), in his congratulatory address at the ceremony, requested that “the organization do its best to represent the interests of the dog farmers in the current difficult environment, and to correct the misconceptions about dog meat through a public campaign so the consumption of dog meat can take its place in S. Korean society as a healthy culture”. The National Assemblymen, for various reasons, often leave us at a loss for words, but Assemblyman Cheol-Woo Lee made us doubt our eyes and ears. The basis for the dog farmers’ claims that their farms are lawful is that the law governing the Livestock Excrement Treatment and Management states dog farms that are at least 60m2 in size must have an excrement treatment facility. Therefore, the dog farmers assert, as long as they can confirm they have such a facility, their dog farms are lawful. While the Livestock Industry Act specifies dogs as livestock, this law only regulates the improvement or growth of the livestock. Simply having an excrement treatment facility does not make that dog farm, which is founded on the illegal slaughter and distribution of dogs for consumption, lawful. Why, then, is the dog farmer (President of the Gimcheon Dog Farmers Trade Association) standing firm despite residential homes within 300m of the new site and opposition from the vineyard and plum orchard owners located directly across from the proposed farm? Perhaps because they are confident that both the S. Korean and local governments, which have been ignoring the dog farms and the dog meat consumption issue, will once again take their side. Both KARA and Busan KAPCA see this Gimcheon Dog Farm construction issue as an important turning point in our nation’s anti dog meat activism. While the government and local agencies refuse to address this issue, and the animal protection groups are overwhelmed by the magnitude of this problem, dog farmers are forming trade associations and expanding their operations into massive corporate farming entities and evading the law. They are even protected by current National Assemblyman. On the homepage of his website, Assemblyman Cheol-Woo Lee states, “Heaven gives humans only the amount of pain that we can endure,” expressing concern about the draught and its impact on the rice paddies and farm fields, the crops and orchard farming. His concern, however, does not extend to the nearby residents of the dog farm who are worried about ruining their grape and plum orchards or the neighbors who have suffered for more than ten years because of the horrors of that farm. 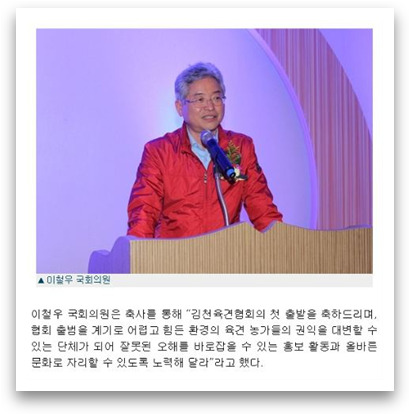 Assemblyman Cheol-Woo Lee, can Gimcheon evolve into an innovative city with that kind of anachronistic mentality that promotes the dog meat industry? Can such a city rebuild its population to 150,000 when there are ongoing disputes over the dog farms and slaughterhouses? Assemblyman Cheol-Woo Lee, you must first take care of the suffering of residents who are constantly worried about ruining their orchard farms and the surrounding environment because of the dog farm. We ask that you seriously consider keeping Gimcheon from becoming a backward dog farm heaven. 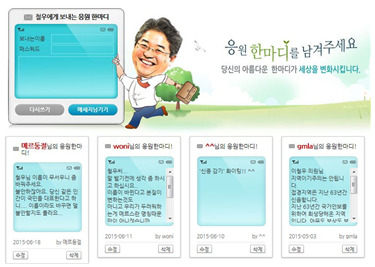 The Assemblyman’s homepage has a function that allows you to send a message directly to him. – Click to go to his homepage. Please send a polite and sincere message to the Assemblyman asking him to stand tall as a great leader and guide Gimcheon forward as a progressive and innovative city rather than drag it backward into a dog farm city. “Dear Assemblyman Cheol-Woo Lee, please help Gimcheon recover its 150,000 population and become an innovative city with the ability to compete nationally in the grapes and plums market rather than the disgusting dog farms. 이철우 의원님, 김천시가 혁신도시로서 인구 15만을 회복하고, 혐오스러운 개농장 대신 전국적인 경쟁력을 가진 포도와 자두 브랜드로 우뚝 서도록 도와주세요. Dear Assemblyman Cheol-Woo Lee, please help Gimcheon recover its 150,000 population and become an innovative city with the ability to compete nationally in the grapes and plums market rather than the disgusting dog farms. 이철우 의원님, 가뭄 속에서 과수 농사 걱정도 부족해, 바로 옆에 개농장이 들어설까봐 걱정하는 농민들이 있습니다. 이분들이 더 이상 걱정하지 않아도 되도록 도와주세요. Dear Assemblyman Cheol-Woo Lee, there are farmers who are not only worried about their orchard farming due to the draught but about a dog farm moving next door. Please help them so they don’t have to worry any more. It is unbelievable to a civilized population that there is actually a country that still believes dogs and cats should be tortured, given a horrible, inhumane death, and will somehow make their reproductive organs work more effectively. Such ignorance, stupidity, shame and cruelty has no place in this world, and no country who accepts it would ever be considered less than totally barbaric and untrustworthy. If nothing else I would be trying to make my country look less stupid. It is no surprise that you do these unspeakable things to the domesticated dogs and cats. Your leaders and government torture and kill humans. We are offended that you eat dogs and cats, we are infuriated at the manner in which you choose to slaughter and cook them. It is completely unnecessary to cause pain to animals, even when they are to be slaughtered. They deserve to be treated with respect and decency. Koreans angry cursed people. I want to have your children died in the same way as these poor dogs.in a world with so many fish, fruits, vegetables, why kill dogs they our good loyal friends. I am ready to give life for dogs no longer will watch your movies your damned nation does not exist for me. you murderer, under false masks your fake smile. I hate you. Your Asia to me is the cruelest Country on Earth,I hate it,I hate how u let Evil monsters eat other people s pets,I hate how they laugh,take hoot while people pets are being Skinned,boiled,burnt alive,it’s like A Top Horror Story That’s what it is. 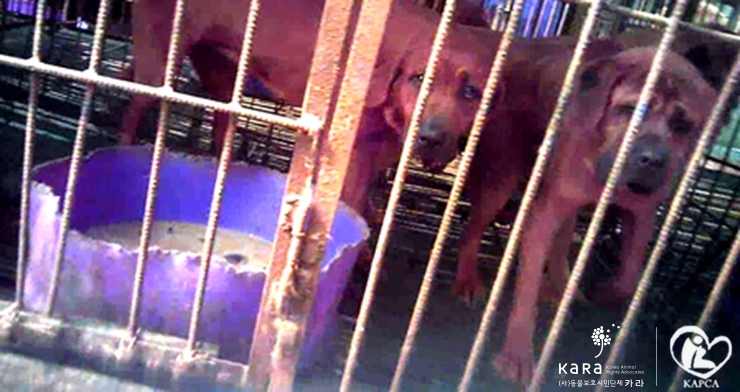 BRING DOWN THESE HORRIFIC DOG AND CAT MEAT FARMS — CLOSE THEM PERMANENTLY! THE WORLD IS WATCHING AND TAKING NOTICE OF THESE FARMERS’ INSANITY AND BRUTALITY AGAINST ANIMALS! This is a question of morality and cruelty to animals that a moral society finds unacceptable and should NOT tolerate! PLEASE help Gimcheon recover its 150,000 population and become an innovative city with the ability to compete nationally in the grapes and plums market RATHER THAN the DESPICABLE, DRACONIAN dog farms — there are farmers who are not only worried about their orchard farming due to the draught, but about a dog farm moving next door. Please help them so they don’t have to worry any more. How can anybody but Asian Eat,boil,skin,beat,burn beautiful cats and dogs alive,then laugh doing it,taking photo,s,I will never,ever buy anything from Asia again,my family and friends did go to your Evil Country,but now,they will not be buying anything Asian again,You Are The Most Evil Country,s In The World,I have family all over the world,I have told them to Stop Buying Any Food,Anything from you Evil Country.You Should Be Ashamed of your Asia.You are teaching your kids and grandkids to Eat,skin,boil,beat burn beautiful Cats and dogs Alive.You Who eat Dogs and cats hope you die the worse Death ever. Your Asia is the most evil place on earth,you are evil,evil,I used to come to Asia with my friends,but now I will tell all my Uni mates do not go to Asia,my friends and family will not buy anything from your evil country again,How can u want your kids to watch dogs and cats bring skinned Alive,Boiled Alive,best,burnt,it’s Evil,you are monsters,your kids will learn to treat Animals like food,you are wrong,I still dream about the Yulin Dogs Festival.Please Do not breed dogs and cats for food. Our french poet Louis Aragon said ” some days I dreamed of an eraser to erase human filth” . I dream about this kind of eraser too .. what a shame that we have still this kind of behavior in a country so advanced as South Korea ! !